The inaugural ArtStories CD has been launched at the Jingili Water Gardens, with His Honour Mr Ted Egan, Administrator of the Northern Territory and Ms Marion Scrymgour MLA, NT Minister for Arts and Museums. 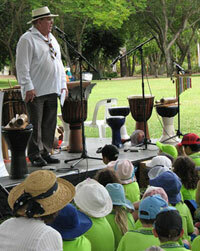 The launch was attended by children from four of the five participating schools in the ArtStories research initiative, Howard Springs, Humpty Doo, Wulagi and Wagaman, and included His Honour Mr Ted Egan singing a laughing song with the children. The upbeat CD, which includes 14 children’s songs, was recorded and produced by local musicians, literacy workers and community elders from Numbulwar Community - an Indigenous community in southeast Arnhem Land. The CD is part of the ArtStories research initiative of Charles Darwin University (CDU) and will be used as a teaching resource. Through this project, Anja Tait is working with members of the literacy team and community members at Numbulwar to focus on achieving Wubuy language targets as a component of the Wubuy Language Revitalisation and Maintenance Program. Anja also works with classroom teachers at Numbulwar CEC embedding arts-based teaching and learning in their daily programs. The CD is the first component of a larger ArtStories teaching resource package of arts-based teaching and learning, supported by NTDEET. ArtStories originated out of Anja’s PhD work with CDU. ArtStories aims to measure the impact of shared artmaking in school communities. 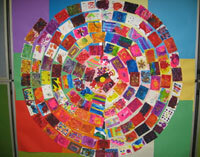 ArtStories works with primary school-aged children, along with participating family members. Over the three years of the project ArtStories is working with five urban, rural and remote Top End school communities, of which Numbulwar is one. ArtStories aims to impact upon: partnership building; wellbeing; student learning outcomes; and arts learning for adults.